If you need help, please call us at (860) 570-5327 or (203) 335-0719. You can also email us at speakupteens@cca-ct.org. Please be sure to include your phone number in your email. Do not include any information that is confidential. Sending us an email does not mean that we are your lawyers. We will read the information you send and will contact you to learn more. Remember, our help is free, but we can help only with legal issues in Connecticut. For information about help in other states, contact the National Runaway Safeline. I am a lawyer and my job is to advocate for teens who are facing problems that make it hard to finish school. Sometimes, the law can help with those problems. That’s where I come in. I worked from a legal clinic in a high school for a few years. I’ve worked with many teens who had to move around a lot because of a bad situation at home, or because their family has no place to live. This can cause problems at school, too. I work with LGBT youth, teen parents, and with teens who are new to this country – and many of them are trying to make it on their own. I use the law to help teens at school, in court (but not criminal or delinquency courts), and to help teens know what their rights are. 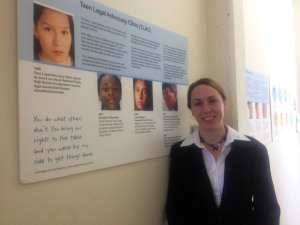 I am a lawyer and I advocate for young adults up to age 24 who are facing problems that can contribute to homelessness, bouncing around, sleeping on a friend’s couch for too long, or not having a stable and safe place to stay. Sometimes the law can help with these problems, and sometimes the law can help make things easier while getting back to going in the right direction. I can help navigate legal guardianship issues, provide immigration assistance for abused or neglected youth, help with legal housing issues for older young adults, education and special-education work for school-aged young adults, employment discrimination cases, and help explain your rights and options after having spent time in jail or prison. Unfortunately I cannot help you find housing. If you do not have a safe or stable place to stay, and you need help today, you should call 211. When you call 211 you can tell them about your situation, and you can also ask for help from one of their Youth Navigators. I am a case manager and my job is to help youth who are homeless, or at risk of homelessness, get resources that keep them safe and secure. I can help you overcome obstacles that get in the way of being successful in school. I work with youth who don’t have a safe place to sleep, youth who are new to this country, youth having problems with school. The lawyers I work with are passionate about their work and I am proud to work with them to help you.